Even tomatoes can only take so much heat. 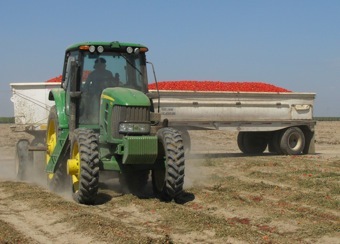 A belt from Bakersfield to the northern Sacramento Valley produces a third of the nation's canning tomatoes. 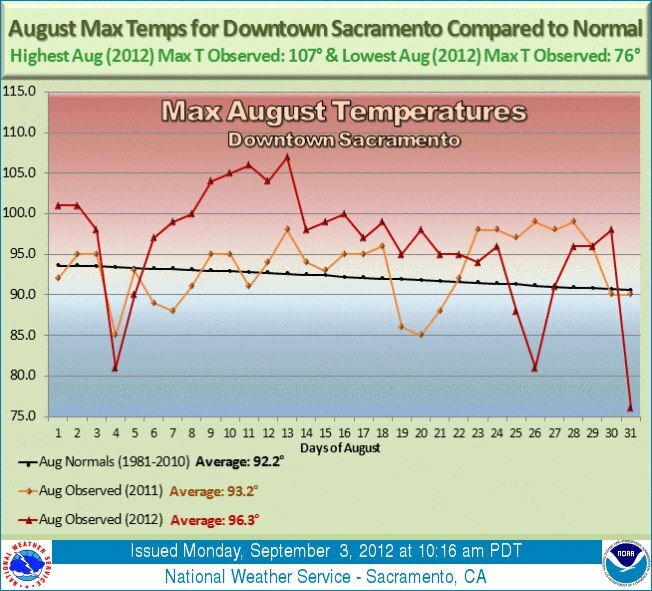 August was more than four degrees above average in Sacramento. The heat wave also meant sky high electric bills for many Californians. The longer growing season, didn’t seem to translate into much cheaper prices at the grocery stores, though. Not that I noticed at least. Californians must adapt a holistic overhaul of our poiicy and practice for energy, environment and economy. Obviously, the current path does not improve the environment at all, meanwhile bankrupting California both at state and city levels in government, economy, education and science/technology. All theses green energy policy and practice appear never to reduce the energy cost and support the economic development in California with little benefit for improving environment. If taking a holistic approach, Californian should put the bio energy in the center for everything we plan for our economy development and environment cleanup (a new concept, not only environment protection but cleanup). For example, there is a maturing, revolutionary technology, called microwave plasma gasification, which is capable to ionize any organic wastes such as municipal waste and forest biomass into basic element status and convert carbon and hydrogen compounds into syngas for biofuel and electricity production with 80% net energy output and zero emission and pollution. In the process, the technology can also recover 60% of metals such iron and allummina. In addition, if allowing the private sectors to cover 1/4 or more California desert area with reforestation, harvest the biomass wastes from all state forest parks and private lands and retrieve all municipal landfills as feedstocks for biofuel and syngas production, these alone sequester all greenhouse gas emission by whole USA power plants and automobiles and graduately eliminate the municipal landfill’s pollution in underground water and in air as well. Also this technology can reduce the cost of all industrial toxic wastes with much better outcome of environment benefits. As continuing, there are two additional parts in the holistic approach I previously suggested, one is to utilize the drip irrigation system for agriculture and reforestation to improve the efficiency of water resources by 90%. Another is to utilize the reverse osmosis technology to desalination of sea water for both residents and industries, using wind and solar power along the coastline. In policy and regulation making, state government should privatize the maintenance and management of public forests and commonditize the biomass for biofuel feedstocks as economic incentives. As estimated, all accumulated municipal wastes and landfills would be enough to generate the biofuel and electricity for all Californians to drive and house utility for at least five years. If 1/4 California desert area covered with industrialized reforestation (forests healthy by proper irrigation and regular thinning), the resulted biomass harvests would be enough to support the same energy production in five years. Besides, this approach almost eliminates the huge properties and lives loss caused by wildfire and firefighting cost every year and the huge air and soil pollution as well.